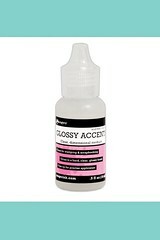 Hello CDD Fans!!! It's Lindsay from the DT here with you on the very last day of the May New Release. If you are new to the CDD New Release Events, on the last two days we always have a look back on the newly released items. 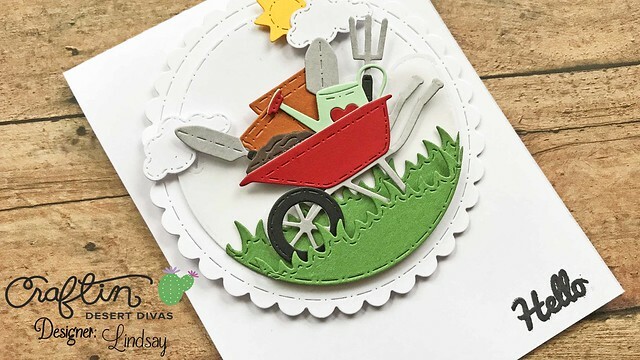 Today, I am sharing a card made with the brand new Garden Accessories Die Set. 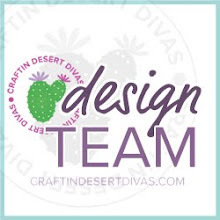 The die cuts I am using, I actually made in the CDD New Release Highlight Video for the Garden Accessories Die Set. Every time I make one of these videos, I always go back and use the die cuts I cut and put together in those videos. So here's a video tutorial sharing how I used those die cuts to create a shaped die cut scene! Like I said above, all of my die cut pieces were put together already. If you want to check out how to put all the pieces together you can head HERE to see the New Release Highlight Video! The only die cutting left to do was with the Stitched In Circle Die Set. I used the large scalloped circle to cut a piece of white card stock, and the smaller plain stitched circle die to cut a piece of white card stock, two green pieces, and one vellum piece. To finish up the die cutting I used the grass border from the Outdoor Landscape 2 Dies to cut grassy border with the green card stock at two different heights. Also, I used the Stitched Scallop Die Set to cut the top of the vellum die cut to create a cloud border. Putting the scene together was quite simple. Using the white plain circle die cut as a base for all the other layers, I first adhered the vellum cloud panel, making sure the circles were aligned perfectly. Next up was the taller of the grass borders with double sided adhesive. Moving onto the wheelbarrow, I wanted to fill it up with all of the gardening supplies. I used a liquid glue, glossy accents for this portion, and glued in all of those gardening elements on the back of the wheelbarrow. 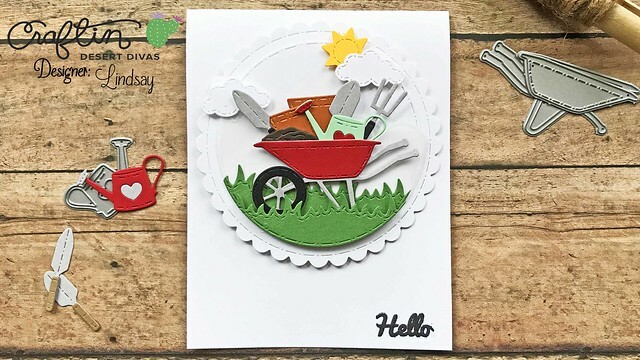 With fun foam and double sided adhesive, I adhered the wheelbarrow onto the circle panel and finally, the last green grass border on the very bottom of the scene. To put the entire card together, I first adhered the scalloped circle with fun foam and double sided adhesive to the top center of an A2 top folding white card base. Inside the scalloped I glued down the die cut scene and stamped a "Hello" sentiment in the bottom right hand corner of the card base with black dye ink. I finished off the scene with a few clouds and a sun die cut from the Scene Builders Die Set. 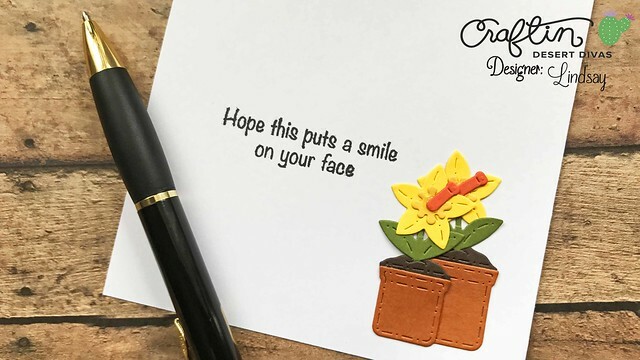 I also decorated the inside of this card with the larger and smaller flower pots, put together with the dirt and flowers in the bottom right hand corner and a sentiment from the "Special Delivery" Stamp Set. This was a super easy card to put together and I just love the way it turned out. Die cutting is one of my favorite parts of cardmaking! It is kind of like a puzzle to me and putting all of the pieces together is so much fun! 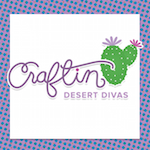 If you are interested in any of the Craftin Desert Divas supplies I used on my card today, they are all linked below! Until next time, Happy Crafting!! !